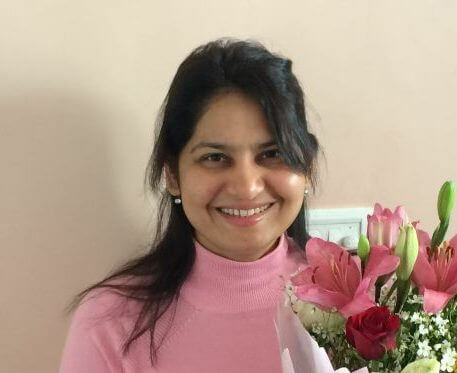 In this article titled ‘Later Mural Traditions’, we discuss about the mural traditions developed in India after the initial mural traditions of Ajanta, Ellora, and other such sites. 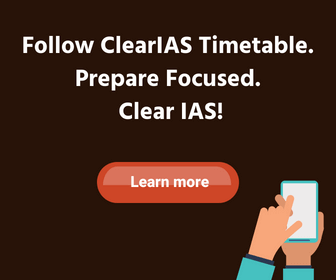 This article is a part of the Indian Culture series based on the NCERT text book ‘An Introduction to Indian Art’ – Part 1. We have already discussed in detail about the Prehistoric Era Art and the early Rock Paintings in our previous posts. The article ‘Later Mural Traditions’ is a continuation of the previous posts like Arts of the Mauryan Period and Post Mauryan Trends in Indian Art and Architecture. Even after Ajanta, very few sites with paintings have survived which provide valuable evidences to reconstruct the tradition of painting. The sculptures too were plastered and painted and the tradition of cave excavation continued further in many places where sculpting and painting were done simultaneously. One of the examples of later Mural tradition is Badami, Karnataka. It was the capital of the western Chalukyan dynasty, which ruled the region from 543 to 598 CE. With the decline of the Vakataka rule, the Chalukyas established their power in the Deccan. The Chalukya king, Mangalesha, patronized the excavations of Badami caves. He was the younger son of the Chalukya king, Pulikeshi I, and the brother of Kirtivarman-I. The cave No. 4 is popularly known as Vishnu cave and in the inscriptions patron (Mangalesha) records his Vaishnava affiliation. One of the paintings shows Kirtivarman, the son of Pulikeshi I and the elder brother Mangalesha, seated inside the palace with his wife and feudatories watching a dance scene. Stylistically the painting represents an extension of the tradition of mural paintings from Ajanta to Badami in south India. The sinuously drawn lines, fluid forms and compact composition exemplify the proficiency and maturity the artist had achieved in the 6th century CE. The gracefully drawn faces remind us of the style of modelling in Ajanta. Their eye sockets are large, eyes are half closed, and the lips are protruding. The tradition of painting extended further down south in Tamil Nadu in the preceding centuries with regional variations during the regime of Pallava, Pandya and Chola dynasties. The Pallava kings, who succeeded the Chalukyas in parts of the south India, were also patrons of the arts. Mahendravarman (Pallava) who ruled the 7th century CE was responsible for building temples at Panamalai, Mandagapattu, and Kanchipuram. The inscriptions at Mandagapattu mentions Mahendravarman I with numerous titles such as Vichitrachitta (curious minded), Chitrakarapuli (tiger among artists), Chaityakari (temple builder), which shows his interests in art activities. Paintings in Kanchipuram temple were patronized by the Pallava king, Rajasimha. Increased ornamentation was a notable feature of these paintings when compared with the paintings of the earlier period. When the Pandyas rose to power, they too patronized art. Tirumalaipuram caves and Jaina caves at Sittanvasal are some of the surviving examples. But it was in the 11th century, when the Cholas reached their zenith of power, the masterpieces of Chola art and architecture began to appear. The temples of Brihadeswara at Tanjore, Gangaikonda Cholapuram and Darasuram were built during the reign of Rajaraja Chola and Rajendra Chola. The important paintings of Chola period can be seen at Nartamalai and Brihadeswara temples. In Brihadeswara temple, the paintings were executed on the walls of the narrow passage surrounding the shrine. Two layers of paints were found when they were discovered. The upper/outer layer was painted during the Nayaka period, in the 16th century. The Chola paintings at Brihadeswara are showing the aspects related to the Lord Shiva, Shiva in Kailash, Shiva as Tripuranartaka, Shiva as Nataraja, a portrait of Rajaraja and his mentor Kuruvar, dancing figures, etc. With the decline of the Chola dynasty in the 13th century, the Vijayanagara dynasty captured and brought under its control the reign from Hampi to Trichy with Hampi serving as its capital. The paintings at Tiruparakunram, near Trichy, done in the 14th century represent the early phase of the Vijayanagara style. In Hampi (Karnataka), the Virupaksha temple has paintings on the ceiling of its mandapa narrating vents from dynastic history and episodes from the Ramayana and Mahabharata. Among the important panels are the one which shows Vidyaranya, the spiritual teacher of Bukkaraya Harsha. 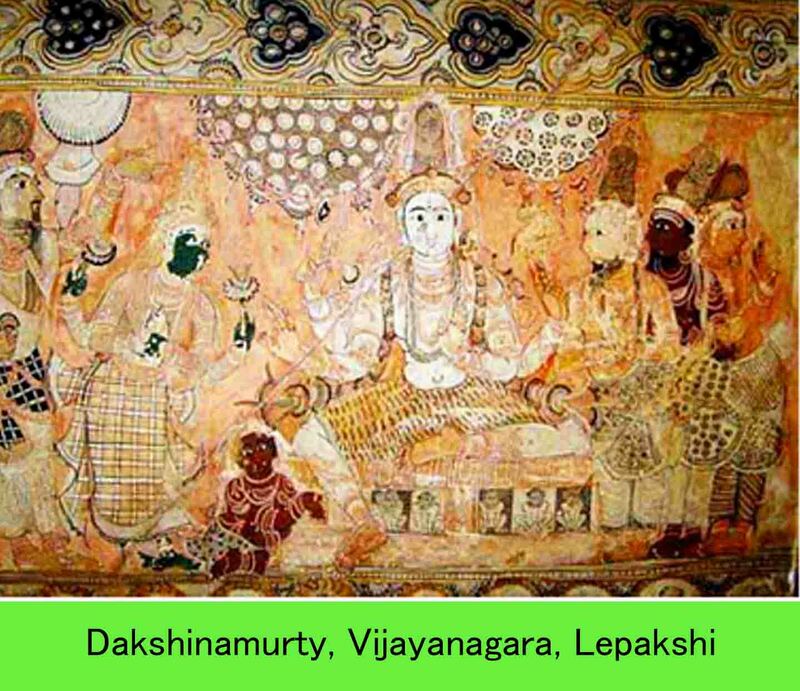 In Lepakshi, near Hindupur, in present Andhra Pradesh, there are glorious examples of Vijayanagara paintings on the walls of the Shiva temple. The stylistic conventions of the proceeding centuries were adopted by artists in various centres in south India as can be seen in the paintings of the Nayaka period. Nayaka paintings in the 17th and 18th centuries are seen in Thiruparakuram, Sreerangam, and Tiruvarur (all in Tamil Nadu). 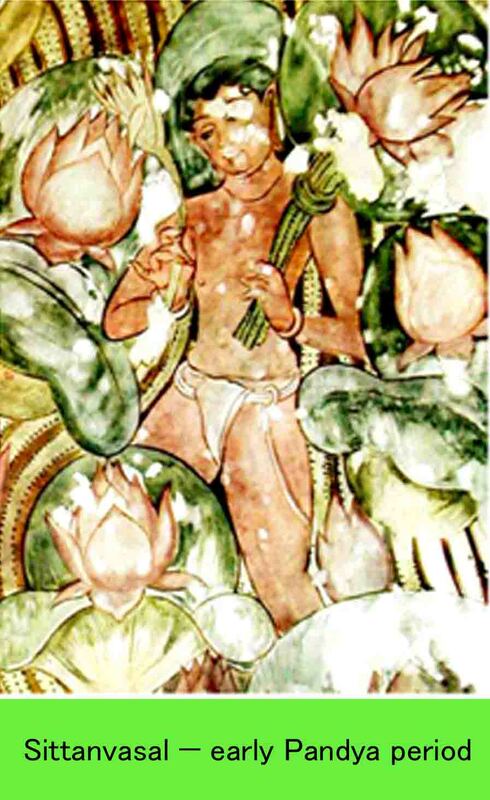 In Tiruparakunram, paintings are found of two different periods – of the 14th and 17th Earlier paintings depict scenes from the life of Vardhamana Mahavira. The Nayaka paintings depict episodes from the Mahabharata and Ramayana and also scenes from Krishna Leela. In Tiruvarur, there is a panel narrating the story of Machukunda. In the Srikrishna temple at Ehengam in Arcot District there are 26 panels narrating the story of the Ramayana, which represents the late phase of the Nayaka paintings. From the examples, it suggests that Nayaka paintings were more or less an extension of Vijayanagara style with minor regional modifications and incorporations. The figures are mostly set against a flat background and the male figures are shown with slim waist but with less heavy abdomen as compared to those in Vijayanagara. Kerala painters (16th to 18th century) evolved a pictorial language and technology of their own while discriminately adopting certain stylistic elements from Nayaka and Vijayanagara schools. The painters evolved a language taking cues from contemporary traditions like Kathakali and Kalam Ezhuthtu using vibrant and luminous colours, representing human figures in three dimensions. Most of the paintings are seen on the shrine walls, cloister walls of temples and some inside the palaces. Thematically too, paintings from Kerala stand apart. Most of the narrations are based on those episodes from Hindu mythology which were popular in Kerala. The artist seems to have derived sources from oral traditions and local versions of the Ramayana and the Mahabharata for painting narrations. 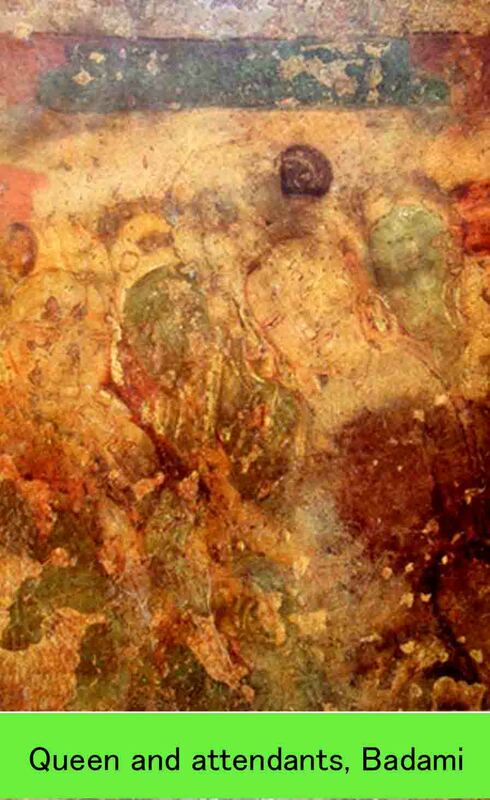 More than 60 sites have been found with mural paintings. The important palaces where mural paintings can be found are : Dutch Palace, Kochi, Krishna Puram palace, Kayamkulam and Padmanabhapuram palace. 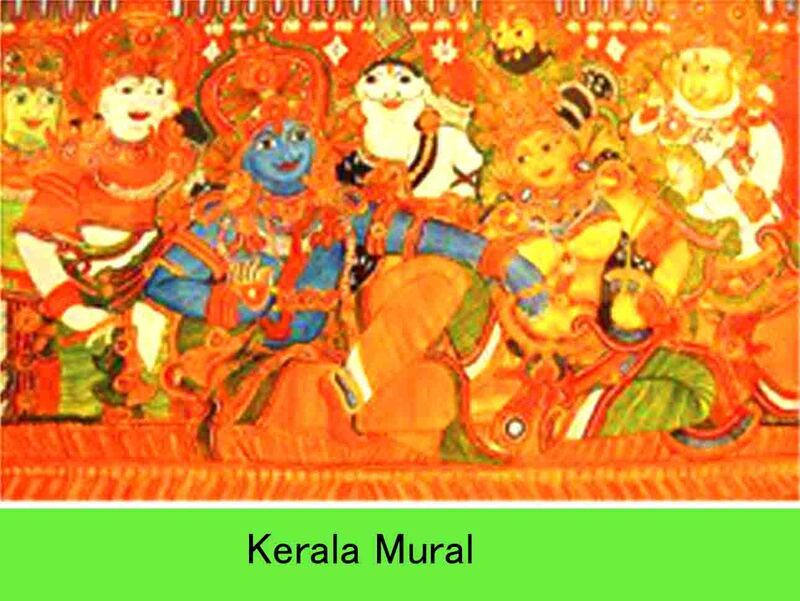 The mature phase of Kerala’s mural tradition can be seen at Pundareekapuram Krishna Temple, Panayanarkavu, Thirukodithanam, Tripayar Sri Rama temple and Thrissur Vadakkunnatha temple. Pithora – Rajasthan and Gujarat.